Soil Requirement: Well-drained, humus enriched. Flower Color Clear lemon yellow flowers marked red at the center. Flower Form Medium sized semi-double flowers, approx. 5.5" in diameter. Foliage Type Medium green foliage is deeply divided into oval to lance-shaped leaflets. Foliage remains attractive throughout the growing season. No fall color. Planting Instructions Dig a planting hole 12" wide and deep, incorporating some garden compost and fertilizer. 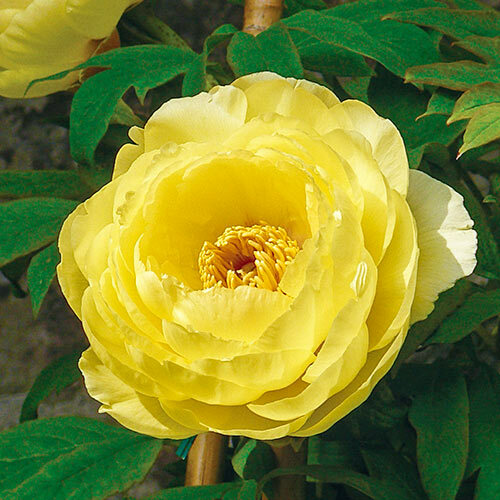 Plant this grafted bareroot tree peonies deeply. 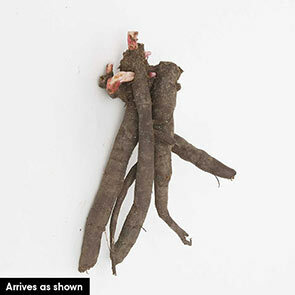 The graft union should be 3 to 4" below the soil. This will encourage the tree peony to make fresh roots and basal shoots. Do not overwater newly planted tree peonies. This is the biggest cause of failure. Soil Requirements Well-drained, humus enriched. Pruning Tree peonies require no or minimal pruning. If needed cut back just above new growth in summer or in fall. Removal of the oldest stems down to the base in the fall after leaf-fall encourages bushier growth, but this is normally not necessary the first 7-10 years.